​VyseAmps has been successfully running amp building courses for a number years now. The course is designed to teach you how to construct a point-to-point wired valve amplifier. The course content is continually reviewed to improve the running of the programme, the learning experience and the fun factor. The course is generally 3 days, all project based and including tuition on relevant background in electronics, valve technology, circuit testing, safety etc. Course members choose which amp they want to make from a wide range on offer. The aim is to completely construct an amp under expert instruction. At the end of the course, the student will possess a customised, hand-built, point-to-point wired amp of high quality - all at a very reasonable price. 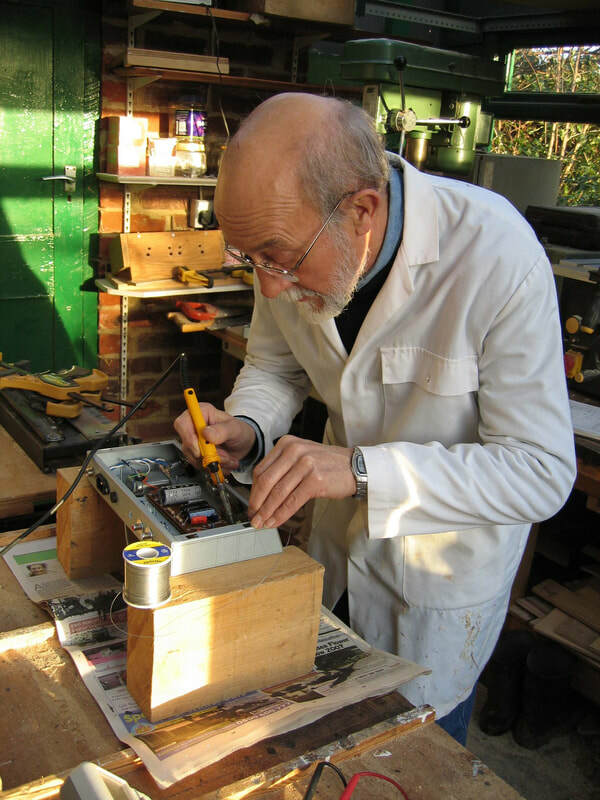 Barry Vyse, who is an electronics expert and has been building amps for many years, will be running the course. He generally works with just two pupils at a time, ensuring enough individual guidance can be given. The most important thing is to select a suitable project. There is a huge range of amplifier kits to choose from, with multiple options, so you really can design your perfect amp. However, take care not to be too ambitious. You must get the most out of the teaching time. Experience has shown that one needs to focus on learning the basics. Get the electronics right and at first build the core model from which your amp derives. Having mastered the ground skills you can then go on to add extras like reverb, effects loop etc if required. You should leave the course with a fully working amp, but for some projects you may have homework to add extra features. You will have learnt the skills to do this work and support is always on offer. Your amp will be housed in a pine, dove-tailed cabinet. A carcass to accept your amplifier is provided on the course, and instruction is given on how to complete this. There is not usually time to finish the cabinet on the course. If you would rather purchase a fully made up cabinet we can provide this to your requirements. The appropriate manual is sent out before the course and we recommend that beginners read Inside Tube Amps. Beginners can also be sent a practice kit to try some soldering etc before the course. 4 days can be arranged for advanced projects or to allow you to build your own cabinet. With the Twin Channel amps you will be expected to have prepared your board under remote supervision prior to the start of the course. The expectation is to have the amplifier working on both channels but additional stages like channel switching or installation of effects would be carried out in your own time. The courses are run at our workshop in Pinner, North West London - Just call to arrange a convenient time. The first step is to decide which amp to build. A huge range is on offer, check out our standard amp kits and then talk to Barry about project suitability. The course members buy their selected amp kit for a 10% discounted price , which additionally includes some partially prepared assemblies for help on the course. Lots of options are available on each amp eg. line-out, power soaks, different cabinet covering, change of speaker etc. There is then a course fee which covers use of all tools and equipment and expert tuition. 3 days for £315, 4 days £420. The working day is around 9.00 - 19.00 with 1 hour for lunch. Lunch and snacks are provided at £30 for 3 days. We can easily arrange dinner if required and then put you in touch with local B&Bs. If for some reason the amp is not completed during the course, support will be given to ensure it is finished. One day follow-up sessions are available covering maintenance, modifications or fault finding at £105. Call to arrange. A deposit of £150 is required when you book, with the balance due at the start of the course. Lean all about servicing and debugging your amp. A really fun and practical day, £170. For those who have experience in building amps but want to take on a more complicated project we can also offer a "distance-learning package". We can supply assistance via email / phone / photos and instructions. Why not call to discuss, 0208 933 0918.